I gave myself administrative privileges in Ubuntu but it still doesn't allow copies. However, I preffer to create a virtualhost in my home folder, it's much easier. Now lets create the www folder, add a simple hello world, disable the default website (/var/www), enable our website mywebprojects and restart apache. And that it, now you dont need to go to /var/www, you simply add files to your www (or other givename) and it's already there :). Press ALT+F2 and enter gksudo nautilus and then click Run. It will open nautilus with root previleges. Goto Filesystem → var → www and now you can add/copy/paste your files. After installing type nautilus -q in your terminal to refresh right click menus. 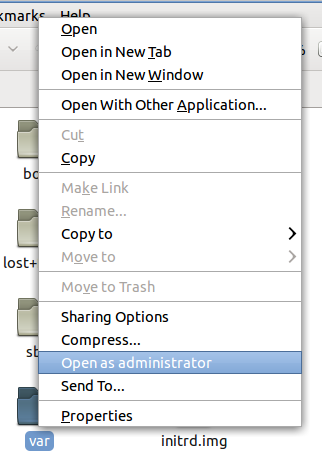 Now you will find 'Open as administrator' entry in your nautilus right-click menu. When you need to open any files with root permission, you just have to right-click on that file/folder and select 'Open as Administrator'. It will open that file/folder with root permission. It could be as simple as sudo usermod -a -G developers $username using ACL. That takes a little work, though, to start. This is for Ubuntu 10.10 at least. First mount the file systems with the acl option in /etc/fstab. Then make a group to which a user may belong for this purpose. The user needs to log out and in again to become a member of the developers group. Then replace references to "/var/www" with "/var/www/public" in a config file and reload. This way, if we want to create directories for frameworks that exist outside the Apache document root or maybe create server-writable directories, it's still easy. Press Alt + Ctrl + T and terminal will open and type sudo -s and login with your password. Now you're logged in as root. Now type in nautilus and it will open the home folder for you as root. So now you can easily edit the files and do whatever you want. /var/www folder is owned by the root.. you have to change the ownership to your own username for modifying files in this folder. For this you can try the following commands..
Now the ownership of the folder /var/www/html will be assigned to the user scott. Now scott can copy/move files in this folder. Not the answer you're looking for? Browse other questions tagged permissions webserver or ask your own question. What permissions settings will make /var/www accessible without admin? How do I copy files with SCP to /var/www? How to FTP transfer files to /var/www?